Hilo Seaside Hotel is 4 miles from downtown Hilo and 1.5 miles from the airport; Hawaii Volcanoes National Park is 26 miles away. Situated in Hilo, this golf hotel is steps from Hamakua Heritage Corridor and Hamakua Coast. University of Hawaii at Hilo is 2.8 mi (4.5 km) away. 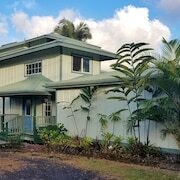 These B&B accommodations are located throughout the area in Hilo. Close to beautiful park and other facilities. helpful information and scheduling of tours. Where to find Hilo hotels near an airport? Where can I find hotels in Hilo that are near tourist attractions? If you decide to book accommodation near the center of Hilo, there are a small range of options. Within easy driving distance from Hilo, you'll discover 7 Expedia recommended long and short-stay accommodation options you can choose from. Hilo's center is within walking distance of accommodation such as Castle Hilo Hawaiian Hotel and Hilo Naniloa Hotel. But of course, a vacation in Hilo wouldn't feel complete if you don't take a visit to the University of Hawaii at Hilo. 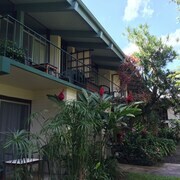 The Castle Hilo Hawaiian Hotel and Hilo Naniloa Hotel, are handy options for those staying in the area because they are within walking distance from University of Hawaii at Hilo. If you'd like to book a place to stay that is close to the Pacific Tsunami Museum, the Hilo Seaside Hotel and the Pagoda Hilo Bay Hotel may be nice options. The Hilo Seaside Hotel is 2 miles (3 kilometers) away from the Pacific Tsunami Museum. 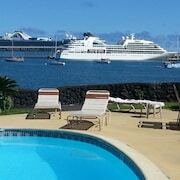 The Pagoda Hilo Bay Hotel is 1 mile (2 kilometers) away. 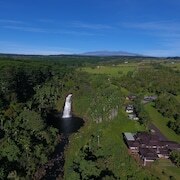 The Inn at Kulaniapia Falls and Hilltop Legacy Vacation Rental are recommended options if you plan on visiting Rainbow Falls while you are in Hilo and want to stay nearby. Check out the Palms Cliff House Inn and the Oceanfront Legacy. 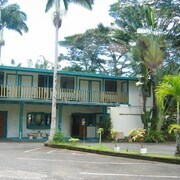 The Palms Cliff House Inn is located 10 miles (16 kilometers) away from the heart of Hilo. The Oceanfront Legacy, is situated 14 miles (23 kilometers) away. Alternatively you could make a booking at the Halana Hale Vacation Rental or the Enchanted Gardens. Looking for more things to do? Consider spending a day or two visiting Kilauea, Volcano Art Center and Gallery and Volcano Winery, which you'll find in Volcano, 25 miles (40 kilometers) to the northeast of Hilo. Should you wish to visit Volcano, check Expedia's booking pages for the latest deals at the At the Crater's Edge and The Artist Cottage. 50 miles (80 kilometers) to the east of Hilo, you'll find Waikoloa, home to the Fairmont Orchid, Hawaii and Mauna Lani Bay Hotel and Bungalows. Whether you're just passing through or staying in Waikoloa, set aside a little time to check out the Waikola Village Golf Club, Waikoloa Kings Golf Course and Genesis Gallery. Kailua-Kona is home to some 12,000 residents, and is situated 60 miles (97 kilometers) east of Hilo. A few local attractions include the Makalei Golf Club, Mountain Thunder Coffee Plantation and Hula Daddy Kona Coffee Plantation Youl'll find some great Expedia-listed lodgings here that that will suit most tastes and budgets. Popular options include: the Four Seasons Resort Hualalai at Historic Ka'upulehu, Wyndham Royal Sea Cliff and Aston Kona by the Sea. Two more hotel choices are: the Wyndham Kona Hawaiian Resort and Royal Sea Cliff Kona by Outrigger. Hilo International Airport is situated 3 miles (5 kilometers) away from Hilo. Travelers who choose to stay close by, can easily book a night at the Castle Hilo Hawaiian Hotel or Hilo Naniloa Hotel. 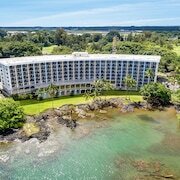 What are the most popular Hilo hotels? 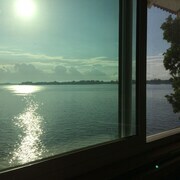 Are there hotels in other cities near Hilo? What other types of accommodations are available in Hilo? Explore Hilo with Expedia.ca’s Travel Guides to find the best flights, cars, holiday packages and more!